Over 150 doctors from private, public and missionary hospitals and those in tertiary institutions in Cross River State, on Wednesday protested in Calabar against the kidnap of their colleague, Emem Udoh. Mrs. Udoh, a Senior Registrar in the Department of Paediatrics, University of Calabar Teaching Hospital, was kidnapped on Monday in Calabar. The doctors who wore black attires had on Tuesday threatened to down tool because six of their colleagues and family members had been kidnapped in the last few months. They had however expressed relief over the release of their colleague, Usang Ekanem, who was kidnapped on December 26, 2017 and set free on January 7. Mr. Ekanem works in Cross River College of Education Medical Centre in Akamkpa Local Government Area of the state. 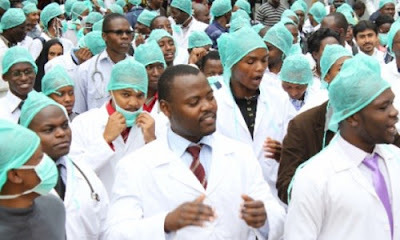 The aggrieved doctors, who protested along major streets in Calabar culminating at the Government House, expressed displeasure with the state government over its approach toward abduction of doctors in the state. The Chairman, Nigeria Medical Association in the state, Effiong Mkpanam, said that all hospitals in the state would remain closed until their colleague was released.